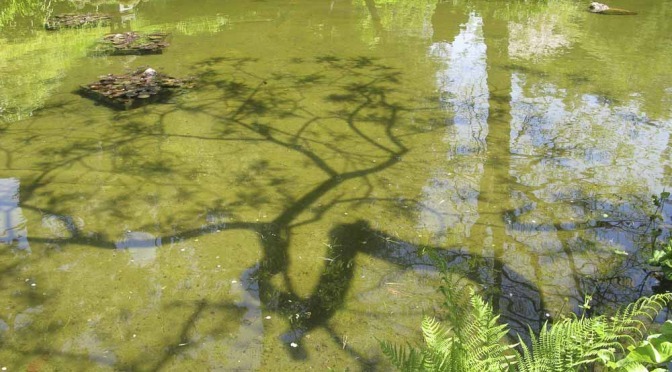 Water and mirrors are probably the most common reflecting surfaces in a garden but glass, which shares many characteristics with them, is another source with additional possibilities. 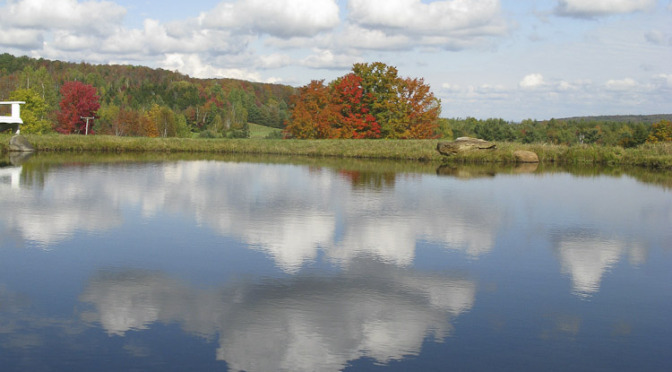 Unlike mirrors, glass is both reflective and transparent. 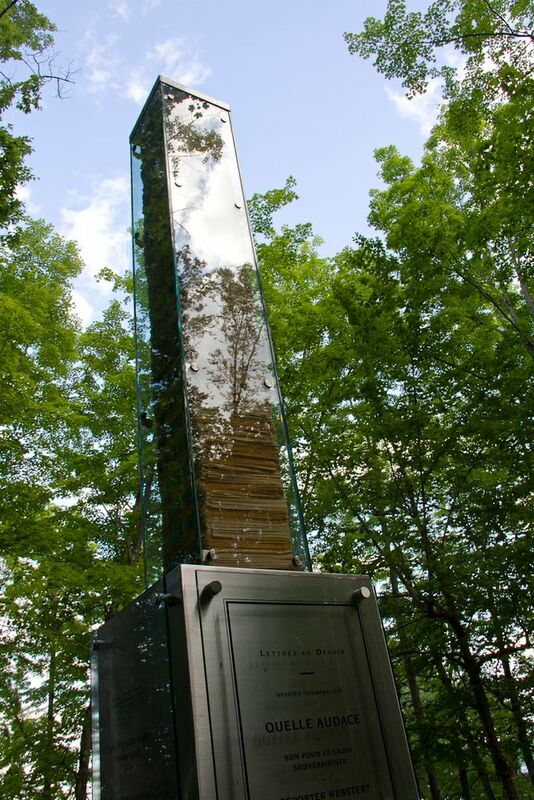 Webster’s Column, a glass and stainless steel sculpture I made to commemorate my husband’s long career in journalism, both reflects the surrounding trees and gives a glimpse of the newspapers stacked inside. 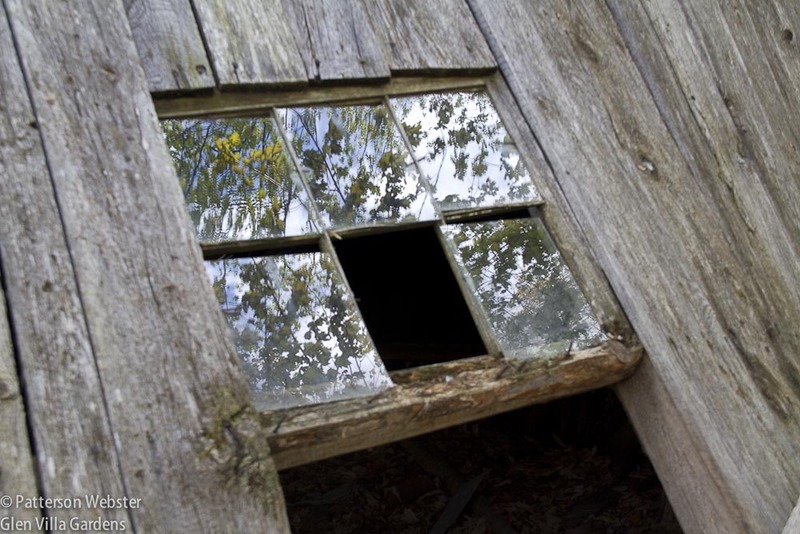 Windows in an abandoned sugar camp reflect the surrounding forest. or in the square panes of a high-rise. 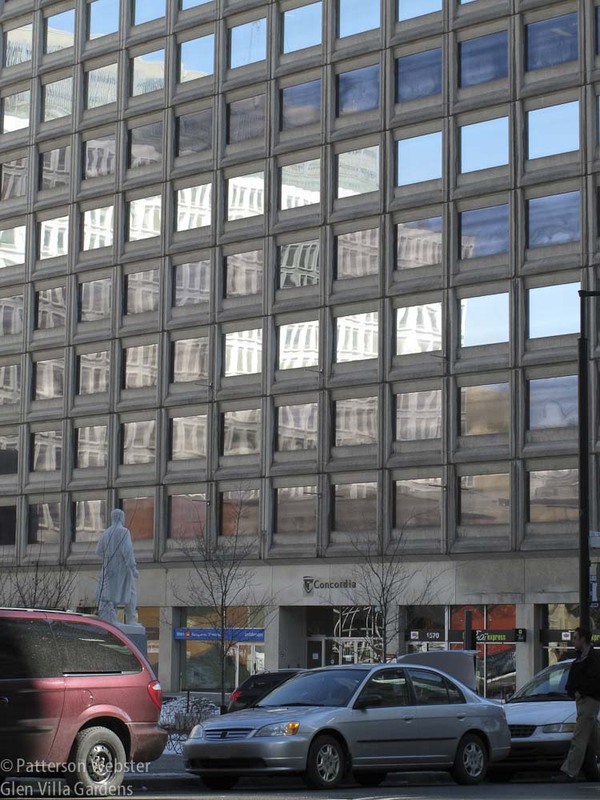 A building in downtown Montreal reflects the urban landscape around it. 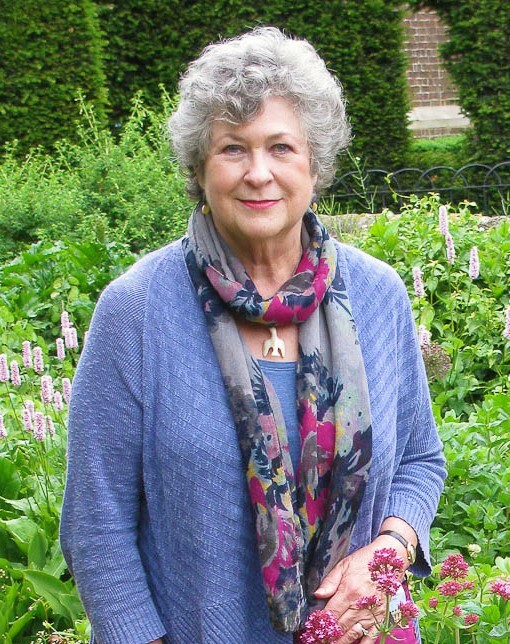 The properties of metal are different and in a garden create different effects. Some metals reflect light more than the surroundings, and that can be a disadvantage if the reflection is a glare — as it can be, for instance, when sunlight hits chrome. 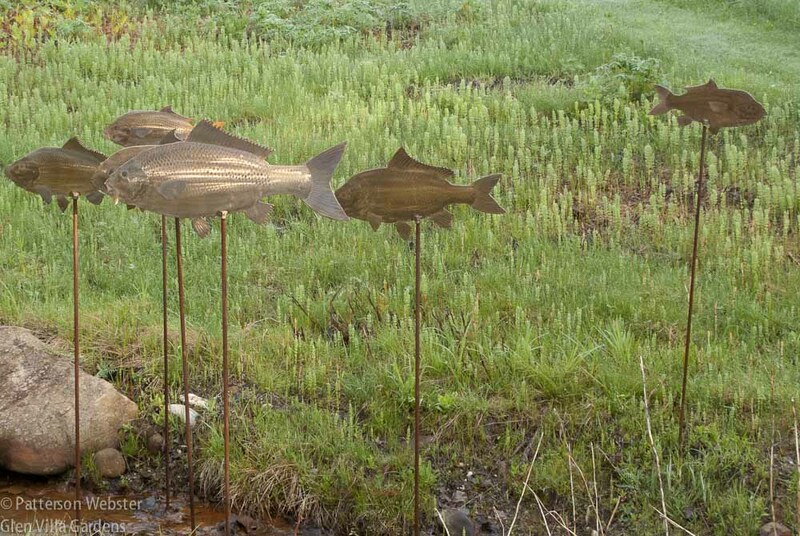 The steel fish that swim through the air above a small stream at Glen Villa don’t glare. Rather, they give off a warm glow. 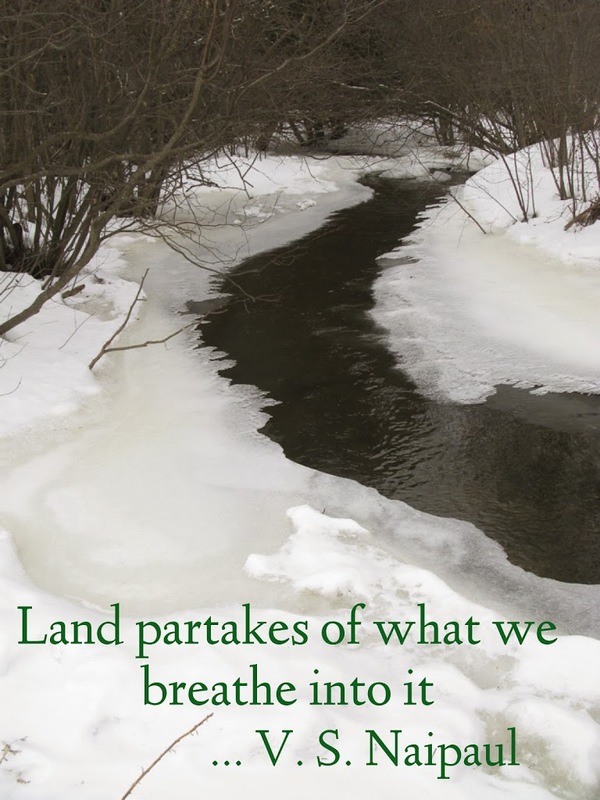 The fish are swimming against the current — all but one who is heading in the opposite direction. They represent my view of my family. No telling which one is the loner! A shark flies through the air at Hatfield House in England like a bomber on a mission. 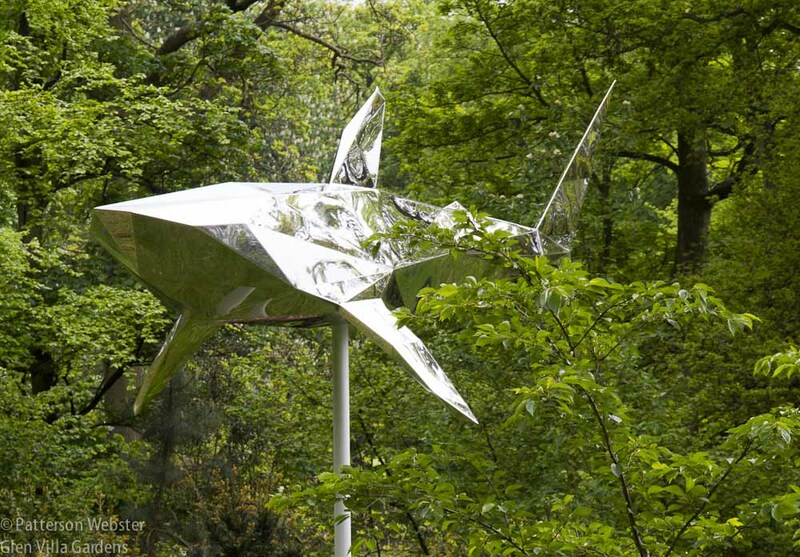 Contrast the shark’s smooth sides with the irregularity of this sculpture by Zhan Wang. What the metal here reflects is not its surroundings but its heritage. Inspired by Chinese garden traditions that prized the misshapen rocks from Lake Taihu, this contemporary sculpture conveys to a modern viewer the same qualities that were valued in the Tang dynasty (618–907 AD): asymmetry, resonance when struck, a glossy surface and a resemblance to mountainous landscapes. 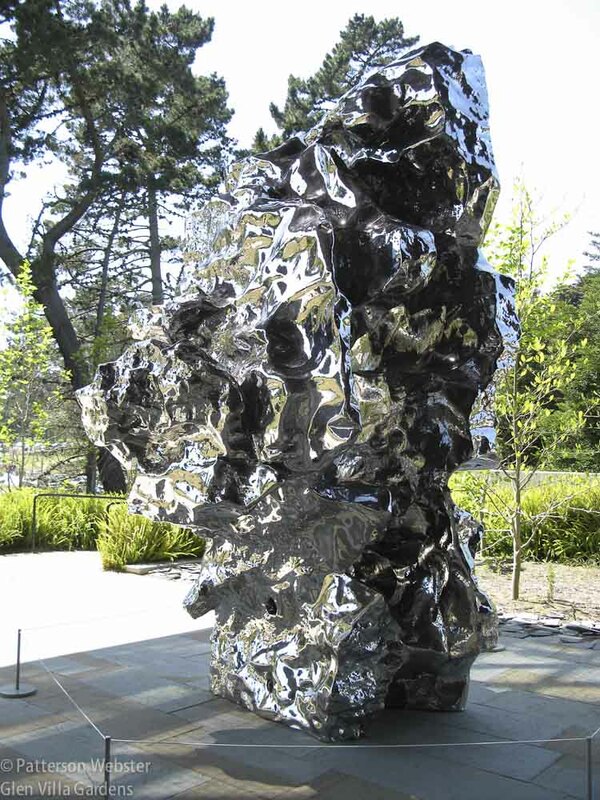 Artificial Rock, 2005, by Zhan Wang, reflects the Chinese preference for vertically oriented rocks riddled with cavities and furrows. Rocks that looked like mountains were used in Chinese gardens to make a point: that a part could suggest the whole. A wrinkled upright rock could stand beside a smooth horizontal one to create a universe that was balanced even if asymmetrical. In the western tradition, symmetry is used more often to create balance. Sometimes the symmetry is simple duplication, as it is below at Sezincote, a house and garden in Gloucestershire. 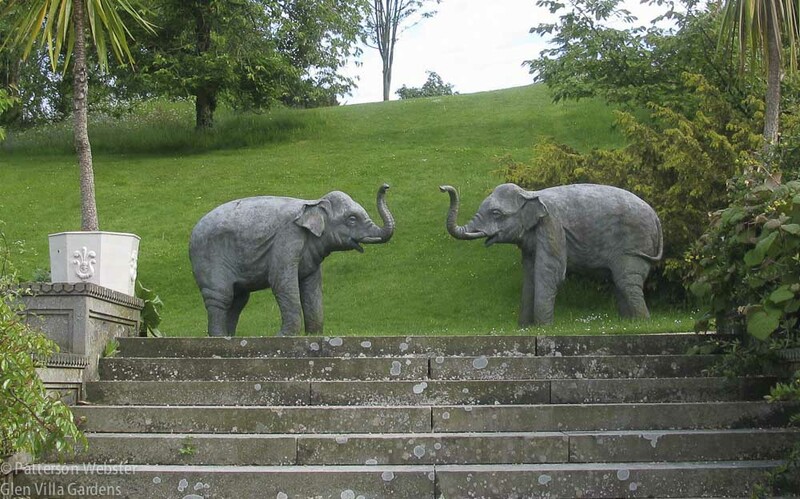 Elephants face off at Sezincote, a house and garden with Indians influences that reflect England’s colonial past. 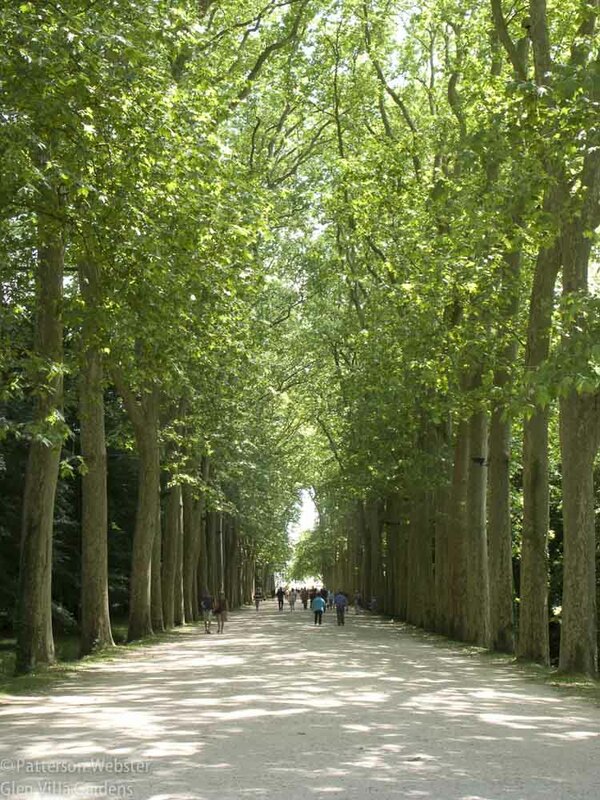 A tree-lined drive leads to Chateau de Chenonceau, built in the early 1500s. The trees were planted more recently. or is from the present day, where we see it in the columns that flank a path at Bosco della Ragnaia, a contemporary Italian garden. 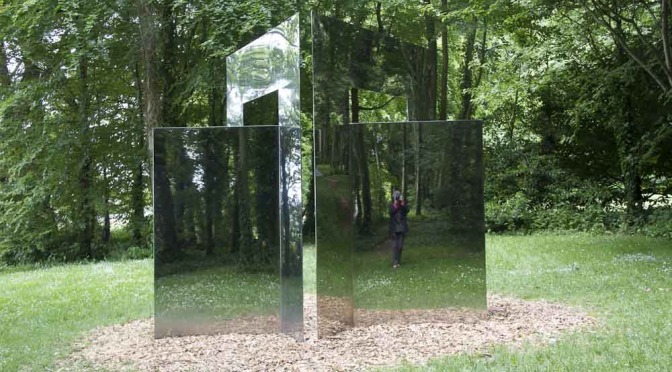 In both settings, the mirrored elements reflect each other — and reflect an attitude towards what constitutes balance in a garden. 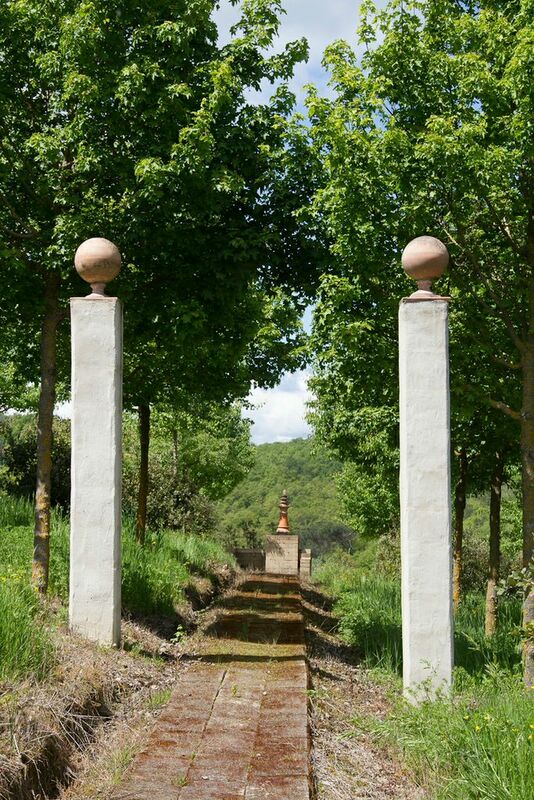 Columns at Bosco della Ragnaia in Tuscany echo trees that so often lined entrance drives to grand estates. A final type of reflection — literal rather than metaphoric — speaks less about balance than about light itself, and about what we choose to notice. 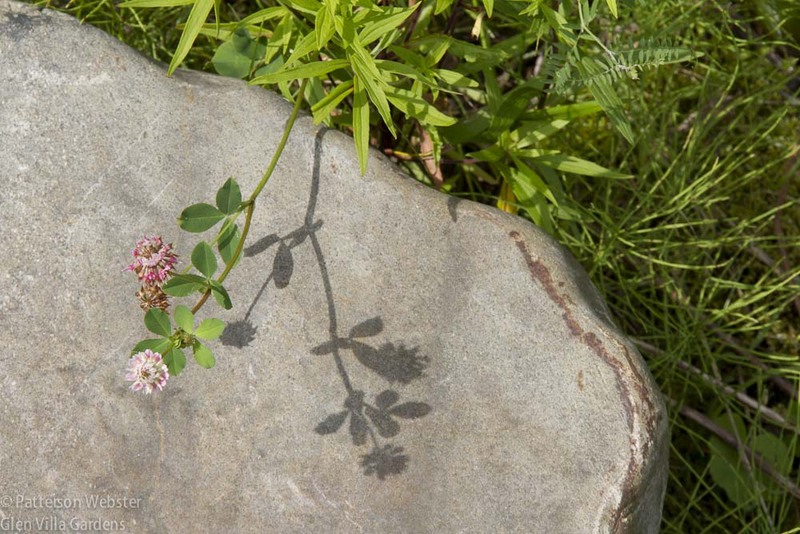 Clover shadowed on stone: a reflection that doubles the pleasure. The shadow of a flower. It doesn’t hold a candle to the real thing.